Today the application landscape is changing rapidly, and IT is trying to adapt quickly to meet user needs for better and faster performance anywhere, anytime for All apps. There are more apps today with evolving protocols, as well as application sprawl and, in some cases, ‘shadow’ apps accessed by employees on their own and unknown to IT. Shadow apps mingle with potentially thousands of other corporate applications, many of which are experiencing an inherent migration to generic HTTP. All of this is compounding IT’s limited or complete lack of visibility into the state and performance of these applications, resulting in an increasing lack of management and control for CIOs and IT Managers. But…while apps are growing in importance, network management methods have remained the same. What’s needed is an application–centric, software-defined, and centralized network management approach across the entire enterprise – branches, remote sites, and clouds of all kinds. SteelConnect, a Riverbed SD-WAN solution, can manage hundreds of applications, including policy configuration and reporting. The solution identifies applications, enables prioritization of apps based on quality of service (QoS), allows the addition of custom customer applications, and features Application Groups to easily enable intent-based policy definition. 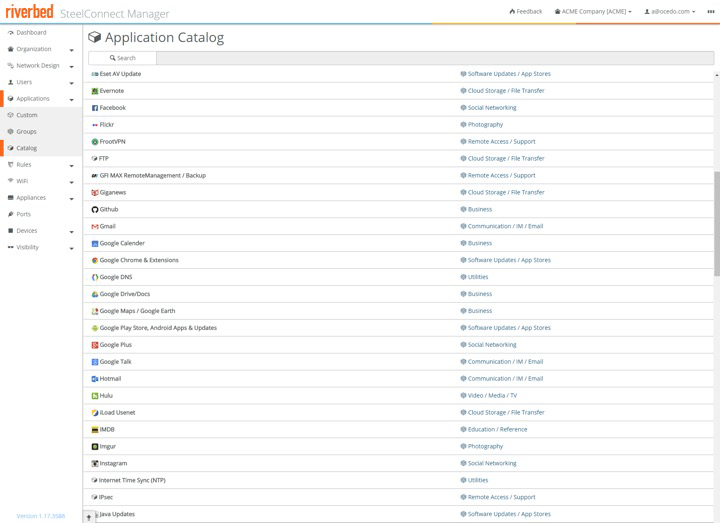 SteelConnect ships with an Application Catalogue with hundreds of apps identified and categorized. In contrast, with other solutions, you have to spend time defining apps with complex configuration based on protocols, IP addresses and urls. SteelConnect also provides a menu-driven, simplified design and workflow and zero touch provisioning of apps and devices, as well as the unified management view of applications and your enterprise. For reporting, a SteelConnect Traffic Timeline shows you how bandwidth being consumed—for example, by what app and user. Once the app engine identifies the app from the application flows and Application Catalogue, it shows the app in the cloud-based SteelConnect Manager’s unified view of your environment. With Riverbed SteelConnect, you can easily change your business intent-based policy in real time based on new insights derived from app reporting metrics—before the user can even report a problem application.